Maggie + Whitney had an amazingly fun wedding this past fall at one of the more unique venues we’ve worked at- Right Proper Brewing Company. Full of tasty meals from their favorite food trunks, sweets from their favorite bakeries and a custom Spotify playlist, M+W truly focused on their love and creating an intimate, fun experience for their guests. 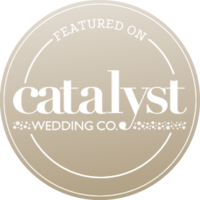 We couldn’t wait to share their wedding day, and are so excited to see it featured on Catalyst Wed Co today!